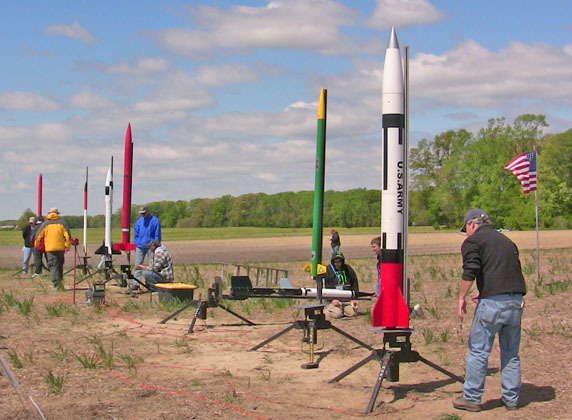 Spring is in the air and that can only mean one thing, Red Glare VIII, the premier rocketry event east of the Mississippi. Ben was too busy at University of Maryland and Monica no longer shows any interest in rocketry. I misled Toni into a romantic 3-day weekend, plus some rocket flying, and she took the bait. 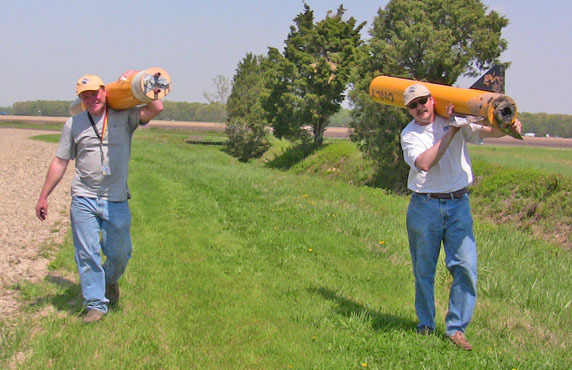 Soon we were dragging our rocket trailer full of rockets across the Chesapeake Bay Bridge heading for Higgs Farm. We arrived early Friday morning to stake our claim along the flight line. A cloud floated overhead that dumped a deluge of rain sparking recent memories of the wet and muddy Red Glare VII back in November 2009. However the cloud soon dissipated to let the warm sunshine through. 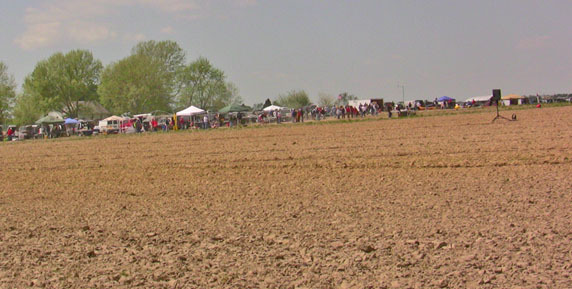 The skies cleared, the fields started to dry, and the temperatures started to rise. It was time to prepare a rocket. I did not get an opportunity to fly You Only Live Twice during the last Red Glare so I was determined to get it into the air for this Red Glare. I dutifully followed my detailed flight preparation checklist, checking each item twice, and then checking it off the list. I assembled my Loki M2550 Blue motor for propulsion. This would be the largest motor for me to date. The blue propellant burns more aggressively and I expected You Only Live Twice to fly faster and higher then its previous flight on a Loki M1882, even though the M2550 only had a 2.5 second burn. I looked around for Ben and realized that he was not there to help. I enlisted assistance from Toni and some good fellow MDRA members and loaded You Only Live Twice on a truck for its journey out to its assigned Away Cell #1. 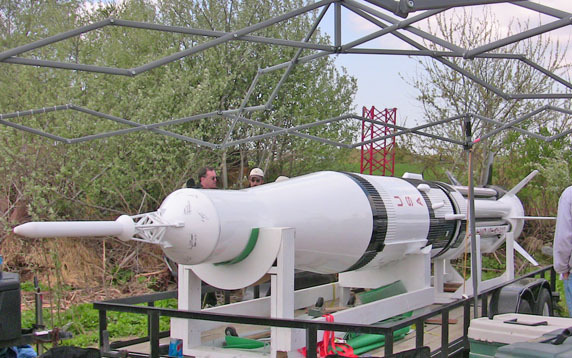 With the help of others, You Only Live Twice was installed onto the launch tower and raised into launching position. The ARTS2 accelerometer and HA45K barometric flight computers were armed and the igniter installed. After a delayed ignition, the blue plume pushed the 82-pound You Only Live Twice to 3,141 feet into the air. The ARTS2 fired the drogue charge with the HA45K firing the backup charge close behind. The two halves separated and started their descent under a 45-inch drogue parachute. At 1,200 feet, the ARTS2 once again fired the main deployment charge with the HA45K backing it up at 1000 feet. 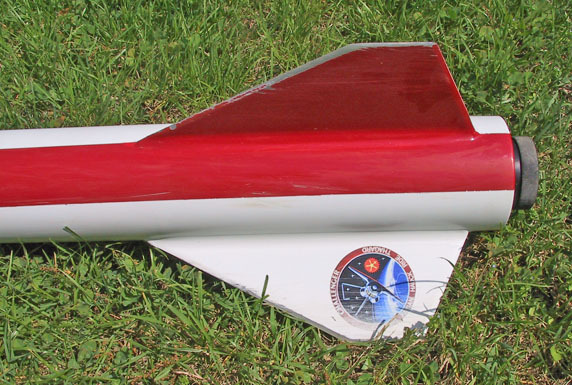 The nose cone was ejected under its own chute and successfully pulled the main chute clear of You Only Live Twice. The rocket continued to drop until the main parachute fully inflated. You Only Live Twice slowly descended and landed in the large creek. Luckily, the sustainer missed the rushing water by mere inches. Again, a good rocket buddy helped me retrieve You Only Live Twice and carry it back to the flight line. There was no damage. Experience You Only Live Twice and twice is the only way to live here. The wind had increased and we debated which rocket to send into the skies next. There were many other rockets flying so Toni chose her Sally Ride and started her preparations. True rocketeers are not afraid of a little wind. Toni assembled a Loki J528 and we attached a small video camera to the side for some great in-flight video. We took Sally Ride to the pad, armed the electronics, and turned the video camera on. Sally Ride bolted off the launch pad and performed her characteristic “nose into the wind” after burnout. 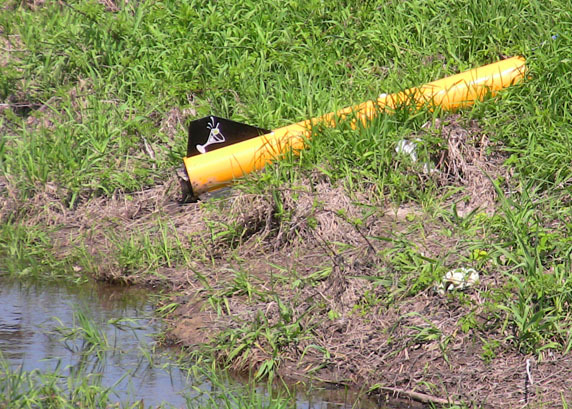 The drogue deployed on queue at 1,340 feet and at 700 feet the mains successfully inflated. Sally Ride drifted with the wind and came to a soft landing just on the other side of the creek. However, Sally Ride’s flight was not over yet. The surface winds failed to release her and Sally Ride was dragged across the field by her main parachute. Sally Ride continued to be dragged across the plowed field, across the meadow, through another stream, through a briar patch, and finally got tangled into some corn stubble. Sally Ride traveled .6 miles along the ground from where she originally touched down. 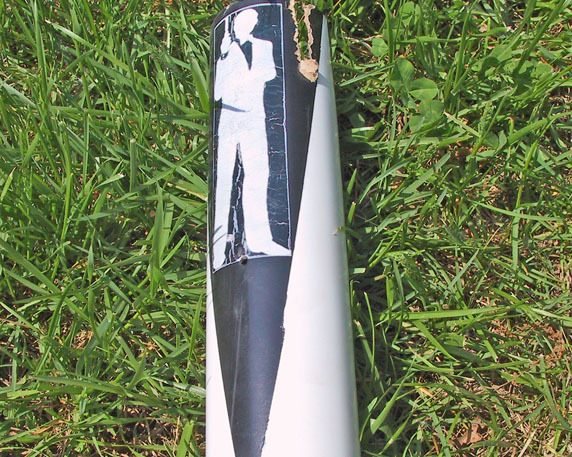 By the time we got to Sally Ride, she was completely filled with compacted dirt and the side of the rocket looked like it was freshly sanded with 60-grit sandpaper. Of course the side that was dragged was the side with the video camera. The camera was destroyed and the video lost. However, all damage to Sally Ride was cosmetic and she will live to fly again, albeit with some re-entry scars. See Sally Ride’s odyssey here. Pay attention to her angle into the wind at motor burnout and the beginning of her odyssey upon landing. We cleaned our motors for the day and enjoyed some cold water and a deserved rest. We were tired, dusty, scratched, and wet from crossing the stream. We locked down our camp and headed to Holly’s restaurant for dinner. Some food and frosty cold ones lifted our spirits and we checked into the hotel for the night. We enjoyed some wine and more cold beers with fellow rocketeers at the hotel before drifting off to sleep. We woke early on Saturday, ate a quick breakfast, and headed back to the field. The weather was colder and the wind was stronger, too strong for Sweet Vengeance. Instead I prepared Shaken, Not Stirred with a Loki H144. Shaken, Not Stirred is a veteran rocket in our fleet and has flown in stronger winds then this. 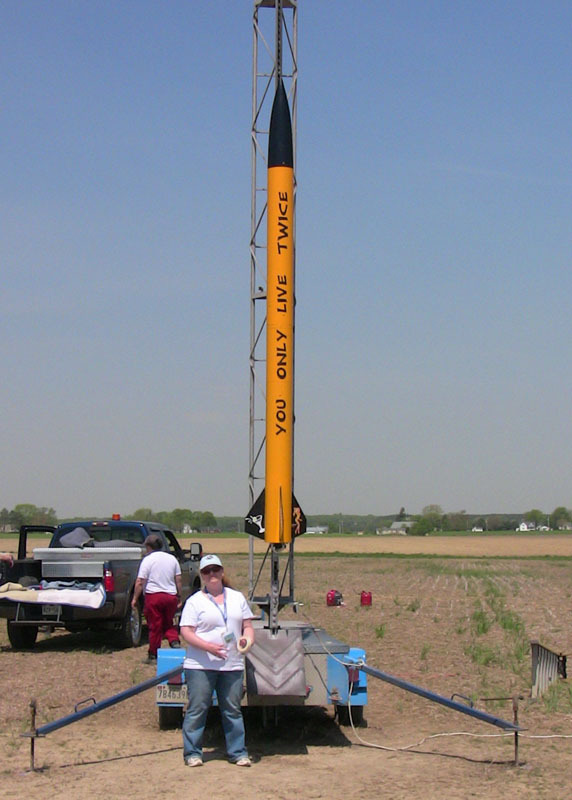 The rocket was taken to the “C” cell and made ready for flight. Shaken, Not Stirred took to the skies on its 24th flight and arced over at 1,371 feet, and kept arcing, and kept arcing. Finally, the backup apogee charge fired, separating the two halves while it was in ballistic recovery mode. The force of the apogee charge also kicked out the main parachute and Shaken, Not Stirred descended until it touched down close by. Further inspection revealed slight zipper damaged that must be repaired before its 25th flight. Post analysis revealed that the electronic apogee charge never fired and will required additional diagnostics. See Shaken, Not Stirred narrowly escape death here and notice the 400 pound V2 in the background. With my favorite rocket out of commission and the increasing winds, Toni and I decided to sit back and watch the other flyers. Saturday is normally the busiest day and this was no exception. We had flyers from Connecticut to Florida and everything was flying into the air. 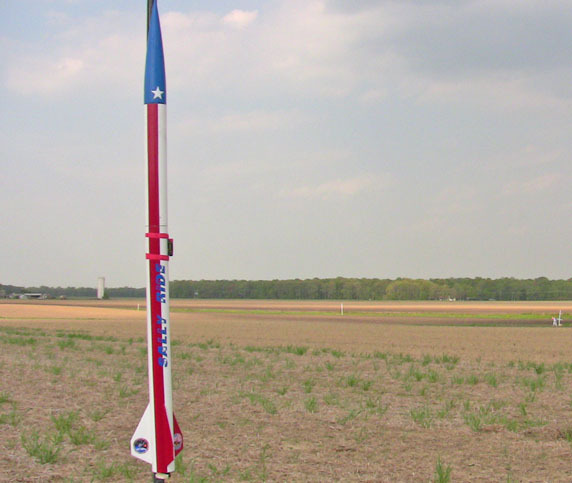 We witnessed a 400-pound V2 and a 20 foot Dinosaur rocket successfully fly and recover. We enjoyed lunch at the onsite Road Kill Cafe and visited the vendors. 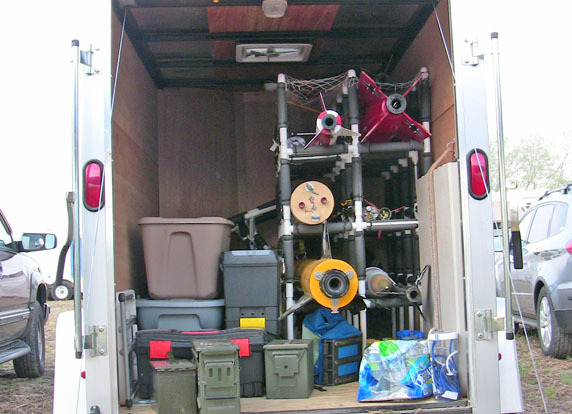 We stocked up on some rocket motors before leaving early to help setup for the MDRA banquet. At the banquet, beer and wine flowed freely as we enjoyed a good meal, entertainment from Rockets Magazine, and visited with some of the big names in rocketry. We finally found our way back to the hotel room and crashed for the night. We woke early to enjoy breakfast at the VFW. Ben and I had this privilege before and I was not about to pass it up as the timing does not happen often. We enjoyed all you can eat scrapple, country bacon and sausage, pancakes, toast, eggs, fresh fruit, and washed it down with coffee, orange juice, and tomato juice. We wobble out of the VFW late and headed back to the field for our last day of flying. 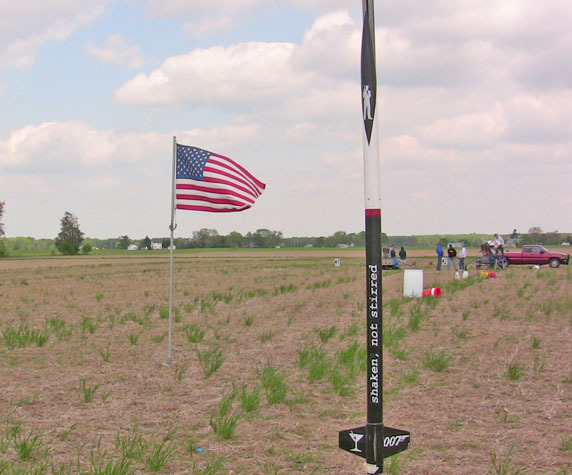 Once again the field was crowded and the lines for the launch pads were growing. Toni and I teamed up and decided to fly Ben’s Legend of Zelda. This rocket has been collecting dust since Ben has been away at college. We decided to install a Loki I405 motor to blow the dust off and took it to the pads. Legend of Zelda appeared happy sitting on the pad and ecstatic when the launch button was pushed. Legend of Zelda took to the skies for the first time since July 2009. Legend of Zelda arced over at 1,972 feet. The mains successfully deployed at 700 feet and Legend of Zelda was having such a great time that it refused to come down. The rocket actually ascended and hovered for a while before finally succumbing to gravity. Legend of Zelda finally came to rest far from the field without any damage. Ben would be proud. See the happy flight here. Legend of Zelda was our last flight of Red Glare VIII. Toni performed some Range Safety Officer (RSO) duties and I filmed and assisted other flyers. We stayed until the end and packed up the field for the summer. 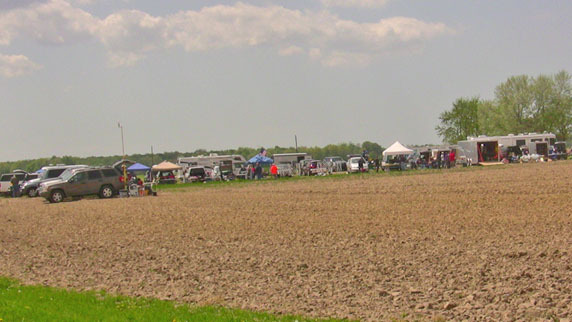 In May, we return to our summer launching grounds at the Central Sod Farm. Toni and I had a great time at Red Glare VIII, despite only having four flights under our belt. We enjoyed the other flights and meeting the other rocketeers. Catch all the Red Glare VIII fun here. Other videos can be found here as well and be sure to check out the Big V2, ¾ Scale Patriot, Neil Brown, and the always fun, Hall of Shame. We left the field in the waning light and stopped for a bite to eat on our homeward journey. We arrived home at 11:30 PM, dusty, wind burned, and wreaking of spent rocket fuel. We would not trade it for the world. Until the next launch . . .